It’s a Sunday, so we don’t celebrate a saint’s day – but still, worth noting, particularly since his life fits in so well with today’s Scripture readings. 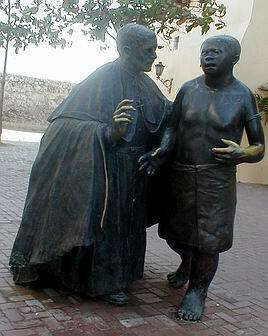 A statue of Peter Claver and a slave in Cartagena. 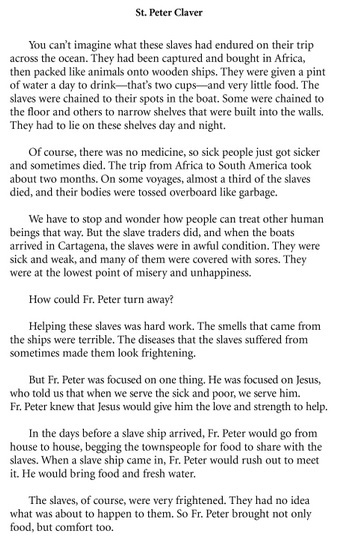 This is a very good introduction, from a Cartagena page. This convent was founded by Jesuits in the first half of the 17th century, originally as San Ignacio de Loyola. The name was later changed in honor of Spanish-born monk Pedro Claver (1580–1654), who lived and died in the convent. Called the ‘Apostle of the Blacks’ or the ‘Slave of the Slaves,’ the monk spent all his life ministering to the enslaved people brought from Africa. He was the first person to be canonized in the New World (in 1888). The convent is a monumental three-story building surrounding a tree-filled courtyard, and much of it is open as a museum. Exhibits include religious art and pre-Columbian ceramics, and a new section devoted to Afro-Caribbean contemporary pieces includes wonderful Haitian paintings and African masks. You can visit the cell where San Pedro Claver lived and died in the convent, and also climb a narrow staircase to the choir loft of the adjacent church…. The church has an imposing stone facade, and inside there are fine stained-glass windows and a high altar made of Italian marble. The remains of San Pedro Claver are kept in a glass coffin in the altar. His skull is visible, making it an altar with a difference.